In late March 2016, a librarian at the Sharon Vermont Library noticed a foundation called NewVistas had been quietly buying up land in four small towns, including her own, for the past year. When the NewVistas Foundation website outlined their plans for a “sustainable,” high-density city, residents of Royalton, Sharon, Strafford, and Tunbridge realized that Vermont’s characteristic wilderness dotted with small towns was under threat. NewVistas is owned by Mormon entrepreneur David Hall, who envisioned a utopic, futuristic city that would house 20,000 people over 1,300 acres of land. This particular city—one of between 50 and 100 cities Hall had been planning to build across Vermont—would be walkable and completely self-sustained. Residents would live in micro-apartments, with robots and other currently nonexistent technological advances to help maintain their compact living spaces. Here, Royalton demonstrates the interplay between the built environment and the natural world typical of all four Vermont towns. Many residents rely on agriculture as their primary source of income. 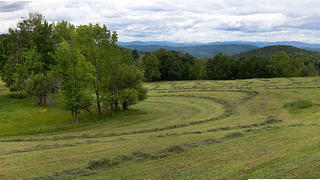 Vermonters also spend their free time exploring the state's abundant green spaces. Though Hall’s plans were decades from being implemented, the threat from the parcels he had purchased were enough to worry Vermonters. “The idea of plunking a community of 20,000 people into the center of these four communities [with] a combined population of less than 10,000 was what really unnerved people,” says Paul Bruhn, president of Preservation Trust of Vermont. The plan’s disruption to the rural Vermont way of life, consistent across all four towns, immediately turned locals off. The state is made up of quaint village centers surrounded by countryside and working forests that residents have interacted with for centuries. The four towns mostly consist of a few central buildings, like a post office, school, cafe, library, and general store (Bruhn considers general stores particularly integral to Vermont’s historic identity). Community members gather in these public spaces for dances, town meetings, festivals, and other social events. Meanwhile, locals regularly interact with the wilderness surrounding their towns—growing their own food and keeping animals, working in agriculture and forestry, or spending a day off hiking, hunting, fishing, or otherwise enjoying the natural world around them. When developers first threatened the towns’ historic integrity in the 1960s, preservationists established Act 250, the state’s Land Use and Development Act. Similar to the Section 106 review process of the National Historic Preservation Act, Act 250 mandates the review of any project’s potential impact on Vermont’s historic and cultural resources. The NewVistas project would certainly have impacted Vermont’s historic character in a way that locals wouldn’t stand for. In August 2016, Tunbridge resident Michael Sacca formed the Alliance for Vermont Communities in opposition to the NewVistas development. The alliance teamed up with other organizations, including Preservation Trust of Vermont, to raise awareness of the threat through social media, public events, and even a 2017 town hall meeting where 93 percent of voters opposed Hall’s plan. 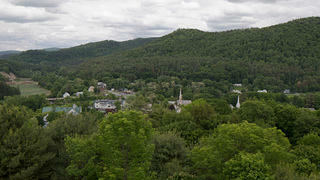 For more than two decades, Vermont seems to have been in danger of falling from an idyllic Eden. 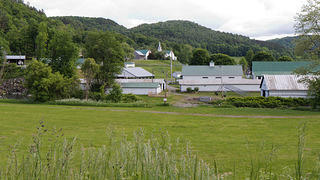 Some of its dairy farms are working to preserve the state's heritage. The alliance also raised $300,000 from the local community and used a bridge loan from Vermont Land Trust to buy a parcel in the center of the area Hall owned and gift it back to the towns as a working community forest. Despite these strong local efforts, the organizations involved needed to shine a national spotlight on Hall’s development plans. 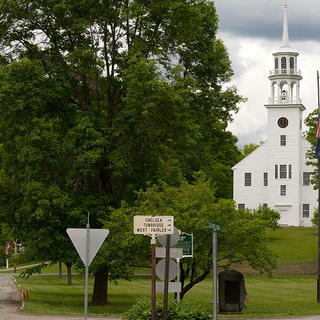 The Alliance for Vermont Communities and Preservation Trust of Vermont brought the four towns to the attention of the National Trust in 2018. While the threat from Hall wasn’t immediate enough to formally add the towns to America’s 11 Most Endangered Historic Places List, Royalton, Sharon, Strafford, and Tunbridge were added as “watch status” sites, or places worthy of a closer eye, on June 26, 2018. While the outcome for the four towns appears bright, there is still reason to be concerned, according to Sacca. Though he initially agreed to sell the 30 parcels of land and had listed them online last June, Hall has since removed the listings from his website. If Hall does move forward with NewVistas, one thing is certain: Local and national organizations will continue to protect the historic integrity of Royalton, Tunbridge, Sharon, and Strafford.